Coinciding with the World Series of Poker, Mansionpoker.net, the fast-growing poker group, opened its new purpose-built TV studios for its blockbuster poker series, Mansionpoker.net Poker Dome Challenge. This is currently airing on Fox Sports Net, and has been filmed up until now at the Tropicana in Las Vegas. The new studios are based in downtown Las Vegas at the intersection of Las Vegas Boulevard and Fremont Street and UK Poker News had the opportunity to attend a special Preview Day and enjoy a “sneak peak” at this new venue. As the accompanying picture – taken at the Preview - shows, this is a high tech arrangement with a bank of spectator seating given a full view of the “dome”, the enclosed area in which the players sit around the special Speed Poker™ table. They cannot see outside of the dome but the spectators can see into it. The audience also has six giant monitors, each dedicated to the individual players, showing close ups of the player, their hand values, heart rates and so on. It is very impressive and atmospheric. The series is into the second of six sections. 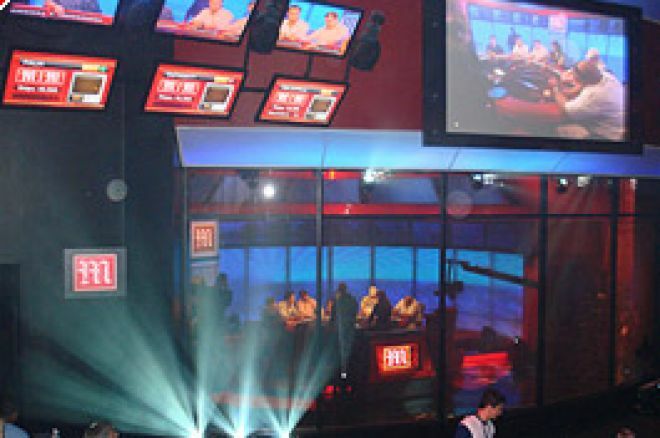 Each section comprises six heats shown weekly on television and immediately followed by a “semi-final” between the winners of the six heats. The heat winners each receive $25,000 while the semi-final winner receives a further $50,000. After all six semi-finals have been completed, the six finalists will play for a huge winner-only purse of $1,000,000. In addition, all finalists will receive a further package worth $16,000 each, for another huge Mansion Poker event! Mansion Poker is running satellites continuously online as the series progresses, so everyone still has many chances to climb aboard the Poker Dome! What is more, the cost of entering is a big fat zero by signing up to Mansion through our special Mansion Poker link here. - Daily meal credit at Caesars Palace resort hotel and casino. Having seen the Poker Dome at first hand, we can most definitely say it will be an experience worth winning, plus there is Las Vegas to explore! The Witch Slot Machine: Are You Stronger Than the Curse?